A major concern in multihull sailing is the possibility of a nosedive/pitchpole in challenging wind/wave conditions. Prevention of this must be a major consideration in the development of a new design. In the CATRI lengthwise stability has been maximised by designing the centre of mass as far aft as possible, with a large main hull stern volume and the rear foils supporting this, full length floats, and a major contribution to stability from the forward hydrofoils. In a wind gust or wave conditions which may bury the bows of another design, the CATRI will lift the rear of the float and rear foil from the water, thus stopping lift from the rear foil, and allowing the aft distributed centre of mass to act maximally in preventing nosediving or a pitchpole (see diagram below). The forward foil, as well as the bouyancy of the forward part of the float continue to provide substantial lift, resulting in considerably more fore-aft stability than that of a traditional trimaran design. This is further enhanced by the wave-piercing design of the float. 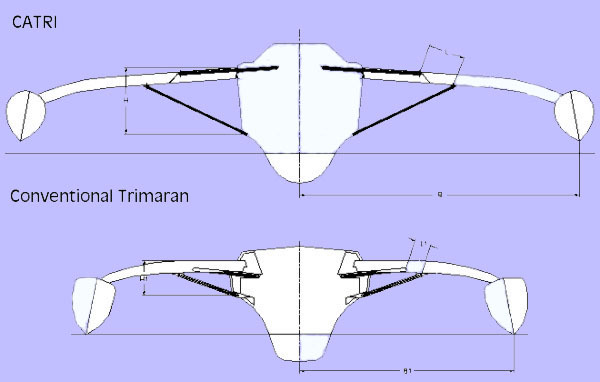 The hydrofoil system adds an extra margin of safety compared to the conventional trimaran. The CATRI has a large beam/length ratio compared to other trimarans of similar size, though retaining easy foldability and trailability. The large beam enhances stability, as does the dynamic lift provided by the foil system. When underway, the foil system lifts most of the float clear of the water (so that the bottom of the float skims the water surface, minimising drag), leaving considerable reserve bouyancy. The performance and stability of the Catri24 in strong winds and high waves are equivalent to those of 8.5m - 9m conventional trimarans. Larger CATRIs can be equipped with an automatic sheet release system. Capsize may occur in any multihull if a big sail area is being carried and a large gust of wind occurs without the mainsheet being eased or released. Whilst this is easy to arrange in a small boat such as the CATRI 24 where the sheets are small and the loads also small, in bigger boats where the loads are much larger the release of the sheets from winches can prove problematic especially when wet. CATRI offer a unique, patented, well proven automatic system which senses boat heeling, and releases the mainsheet and/or the gennaker sheet at a predetermined angle of heel. This system has been thoroughly researched, developed and tested with the CATRI range in mind: it functions extremely well, and will allow greater peace of mind for the novice or shorthanded sailor (or the racer who wants to push the CATRI to its limits). The CATRI is an ideal cruiser or racer, utilising 21st century technology to achieve new levels of performance and safety at an affordable price!